DALLAS, June 30, 2017 /3BL Media/ — Kimberly-Clark Corporation today published its annual report on sustainability, providing the first update on the company's global progress toward its Sustainability 2022 goals. Introduced last year, Sustainability 2022 is the company’s framework to address social and environmental challenges with programs designed to create social, environmental and business value. In its first year, Kimberly-Clark surpassed three of its five sustainability targets, and is on track to meet or exceed all of its goals by 2022. “At Kimberly-Clark, our vision is to lead the world in essentials for a better life, and through our commitment to sustainability, we are proud to demonstrate our values through proactive environmental and social programs in the communities where we live, work and sell our brands,” said Chairman and Chief Executive Officer Thomas J. Falk. Social Impact – Working with our customers, consumers and suppliers, programs including Toilets Change Lives, No Baby Unhugged and The Period Project worked to improve the well-being of more than two million people in need in 2016 through social and community investments that increased access to sanitation, help children thrive and empower women and girls. Forest & Fiber – Kimberly-Clark sourced 89 percent of the fiber used in its tissue products from environmentally-preferred sources. We also strengthened our partnership with the Forest Stewardship Council® to engage consumers in protecting forests. Waste & Recycling – We expanded our waste and recycling programs to include challenges of waste at both ends of the supply chain. In 2016, we diverted 95 percent of manufacturing waste from landfills, and diverted more than 5,000 metric tons of post-consumer waste through partnership programs around the world. Energy & Climate – Our efforts to drive innovation in energy management helped achieve an absolute reduction in greenhouse gas (GHG) emissions of 16.8 percent over a 2005 baseline, which includes direct and indirect energy sources (Scope 1 and Scope 2 emissions1). Sustainable Supply Chain – In 2016, the company introduced new imperatives for occupational safety, reinforced our environmental compliance capabilities and completed a total of 205 social compliance audits of customer, supplier and Kimberly-Clark workplaces. In addition, we invested in the development of solutions that support mills and communities in water-stressed regions. “These results were achieved by our people, and we applaud their leadership in creating a more sustainable future for our business and the communities where we live and work,” said Lisa Morden, Senior Director for Global Sustainability. Kimberly-Clark’s 2016 Global Sustainability Report details the company’s strategies and key performance indicators against its goals for 2022. The report is organized and presented in accordance with the Global Reporting Initiative (GRI) Sustainability Reporting Standards, Core level. 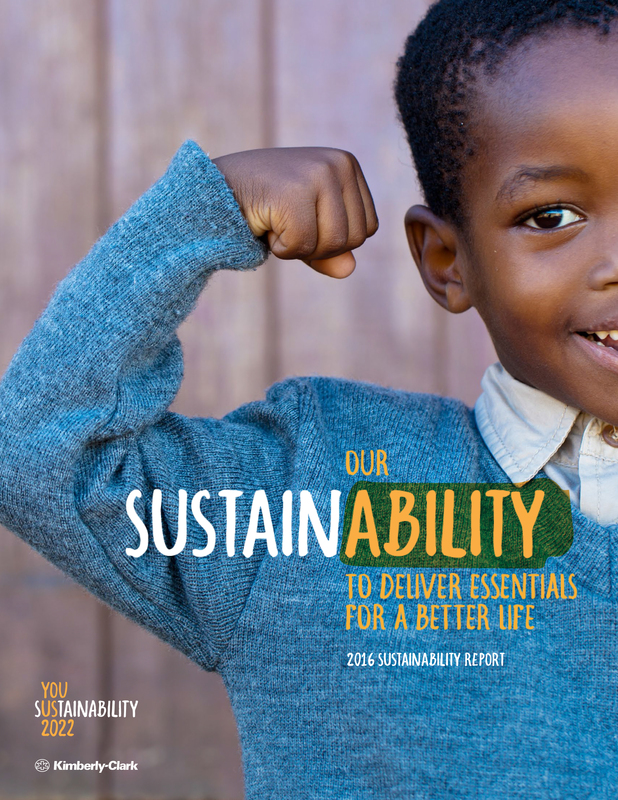 Read Kimberly-Clark’s entire 2016 Global Sustainability Report, as well as stories from employees and teams around the world, on our website at www.Sustainability2022.com. Kimberly-Clark (NYSE: KMB) and its well-known global brands are an indispensable part of life for people in more than 175 countries. Every day, nearly a quarter of the world's population trust Kimberly-Clark's brands and the solutions they provide to enhance their health, hygiene, and well-being. With brands such as Kleenex, Scott, Huggies, Pull-Ups, Kotex and Depend, Kimberly-Clark holds No. 1 or No. 2 share positions in 80 countries. To keep up with the latest news and to learn more about the company's 145-year history of innovation, visit www.kimberly-clark.com or follow us on Facebook or Twitter. 1 Scope 1 greenhouse gas emissions are from sources that are directly owned or controlled by Kimberly-Clark; Scope 2 emissions are indirect emissions from Kimberly-Clark’s consumption of purchased electricity.